This is the cardinal rule of twin scheduling. If one is hungry, feed both. If one is tired, sleep both. If one wakes early from a nap, either leave the awake one in the crib until the end of nap time or get them both up. I found this pretty easy to execute during the day. But waking a sleeping baby at night time was always really difficult for me. I’d have one baby crying at 3am and one baby dead asleep and I’d think, how long would this peaceful baby sleep if I don’t wake them? Would they sleep through the night? Am I creating a habit by waking to feed them? When it comes to newborn twins, always wake the second baby and feed together. How do I know this? First, because on 3-4 occasions I decided to test the validity of the cardinal rule and only feed the baby that was awake. Disaster. DISASTER! I was literally up all night feeding alternating babies. As further proof, my twins slept through the night earliest of all my kids – and were the only ones to do it naturally – even though I consistently fed both when one woke. I have read that some twin moms have their twins on schedules 30min apart so they can feed and go through a nap routine separately. If that works for you, great, but it sounds totally unrealistic for anyone with more then just twins. My preference has always been to do everything together – feeding, nap routines, diaper changes, clothing changes, baths, you name it. In the beginning it may feel like you’re having to really mess with their natural sleep and eating patterns to make it happen, but it really does pay off in the end. 1. The fastest way to get them on a napping schedule is to nap them in the crib from the beginning. 2. Tandem feeding in public is difficult, if not impossible, with newborns. If I wanted to feed them together I had to be home. 3. Naps are less predictable and controllable on the go. With one baby, if you go out during nap time and the baby doesn’t nap, you just come home, put them down right away and adjust the schedule from there. But with twins, inevitably one twin will fall asleep while you’re out and the other won’t. Then when you get home, one baby is well rested from their little snoozer in the car seat and the other baby is tired and ready for a nap. It’s much more difficult to control who is or isn’t sleeping when you’re out of the house, so to keep them on the same schedule it’s best to stay home. A few notes on that point: first, your older children will not die if you don’t take them to the park or the library for 6 months. This is just a season. Prepare your older kids by working on their independent playtime skills and getting them used to being at home before the babies come. Once the twins get a little older and can handle more wake time, you can resume your old park routine. Second, invite people over to your house! I lead a weekly bible study from my home where six friends bring their kids over to play while we discuss. This gives my older kids time to play with other children while my twins can still be napping in their crib. Third, when you DO need to get out, be prepared by bringing a pack and play. I’ve been known to lug that thing to the beach, to the park, to friends’ houses, and even to church! I have a portable white noise machine and a big blanket I drape over the top to darken it. Because they are in such a consistent schedule at home, they nap pretty well in other locations as well. Any mom with more than one child can attest to the fact that babies are all very different and even in the area of sleep, they have different needs. The optimal wake time for your first child may have been entirely different than the optimal wake time for your second child. This is true with twins as well. How does a twin mom balance the unique sleep needs of her babies with the desire to keep them on the same schedule? For newborn and infant twins, I think it’s generally best to set wake time by the lowest common denominator – by the twin who needs the most sleep. 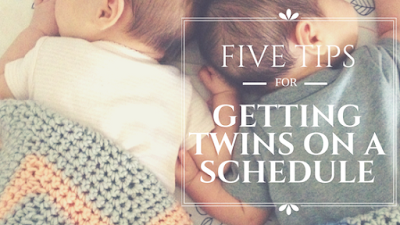 This means if one twin’s ideal wake time is 65 minutes and the other twin’s ideal wake time is 50 minutes, you put both twins down for a nap at the 50 minute mark. The twin who needs the longer wake time will learn to hang out in the crib a few minutes until they fall asleep. Remember the cardinal rule: Feed them and sleep them at the same time. I know a lot of people are big on nap time and bed time routines, but until a child is older, I’ve never really found them to be very helpful. An elaborate routine of baby massage, singing, rocking, and patting just creates more work for the parent – ultimately the baby still has to learn to fall asleep independently when you put them down in the crib. With a singleton you may be able to spend time rocking to sleep for the first few months, but this just isn’t a reality with twins. You may rock one until drowsy and lay them ever so gently down in the crib, but what if they start screaming while you’re in the middle of rocking the other one? How can you shush/pat two babies in different cribs? If they’re going to have to learn to self-soothe anyway, my thought has always been that the “nap time routine” should just be to put them down, shut the curtains, turn on the white noise, and walk out. This has served me well. All 4 of my kids, including my twins, have learned to fall asleep without requiring any intervention from me. I think this is one that applies both to one baby and twins. Babies’ sleep needs change very rapidly in the first year of their life. Even just between months one and six they might go from needing 20 hours of sleep split into a night and 4 naps to needing only 16 hours of sleep split into a night and 2 naps. That’s a big change in a short period of time! You may figure out the ideal schedule for your baby at their specific age, but if you just keep doing that exact same thing day after day, they will soon outgrow the schedule and stop sleeping or eating as well. Schedule changes can either be reactionary (your response to something suddenly going haywire with their sleeping or eating) or they can be proactive (you pushing them in the direction you want to go). A reactionary change might be spurred on by two days of short naps. A proactive change may be made by a desire to get all your kids on the same napping schedule. Either way is fine, but in both cases you have to know what’s ahead in order to make a swift change and avoid floundering. I try to always have in my mind not only what my twins are doing right now in terms of sleeping and eating, but what’s right around the corner. This keeps me moving in the right direction – toward the next goal – and keeps them on the right trajectory as their sleep needs change. My twins are only a little over five months as I write this so I can’t really comment on what’s to come, but by sticking to the principles above, the first five months have been much easier than I could have possibly imagined. Twins demand a more strict adherence to a routine and a schedule, but if you’re willing to make the required sacrifices, the results are no different than a single baby. Diligence and consistency reaps the reward of two well rested babies. 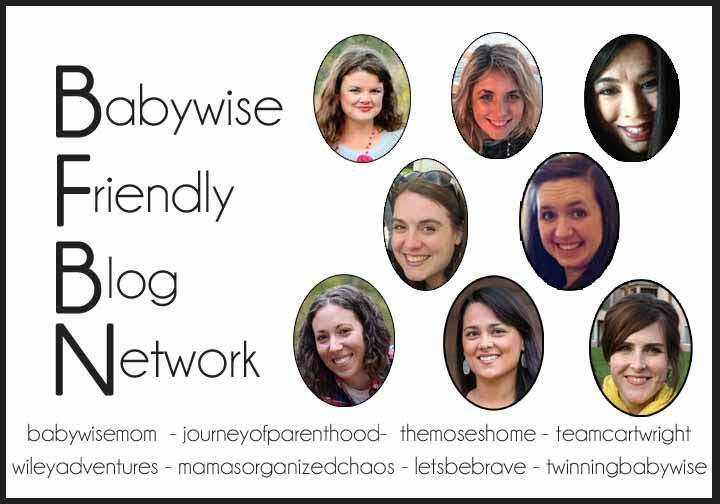 Check me out on The Journey of Parenthood today. I am talking about raising that child who is the opposite of you.